This is the classic fajita base and can be amended with all sorts of other veggies if you like. Think: Mexican Zucchini or Grape tomatoes, even broccoli and mushrooms can be tossed in with these guys for a treat. The Lodge cast iron pan serves a dual purpose. First it makes a pretty awesome pan for presentation when you have company. Second, it will keep them hot and fresh on the dinner table for more than 30 minutes while you eat your tacos. 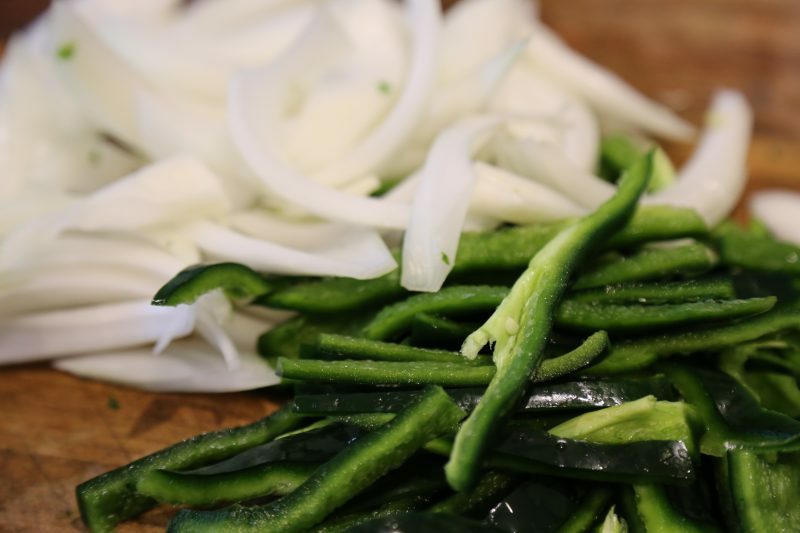 For this recipe I use the ratio of 1 good size sweet onion to 4 poblanos to serve around a dozen tacos. Half or double to your hart’s content. Then on all the way high, heat 3 tablespoons of vegetable/canola oil in a non stick pan until it smokes and add the onions and peppers. The hot pan will help color the onions and blister the peppers pretty quickly. Toss them for around five minutes and then add the juice of one lime or 3 tablespoons of lime juice and a tablespoon of salt. Toss until the juice has sizzled away and then place the peppers in a bowl to the side while you prep the rest of your dinner.